Living in Los Angeles, we’ve had a lot of opportunities to dine at the restaurants of celebrity chefs. And more times than not, they’re just… average. But Ventura Blvd. here in Studio City seems to have more than it’s share of quietly interesting celebrity joints. 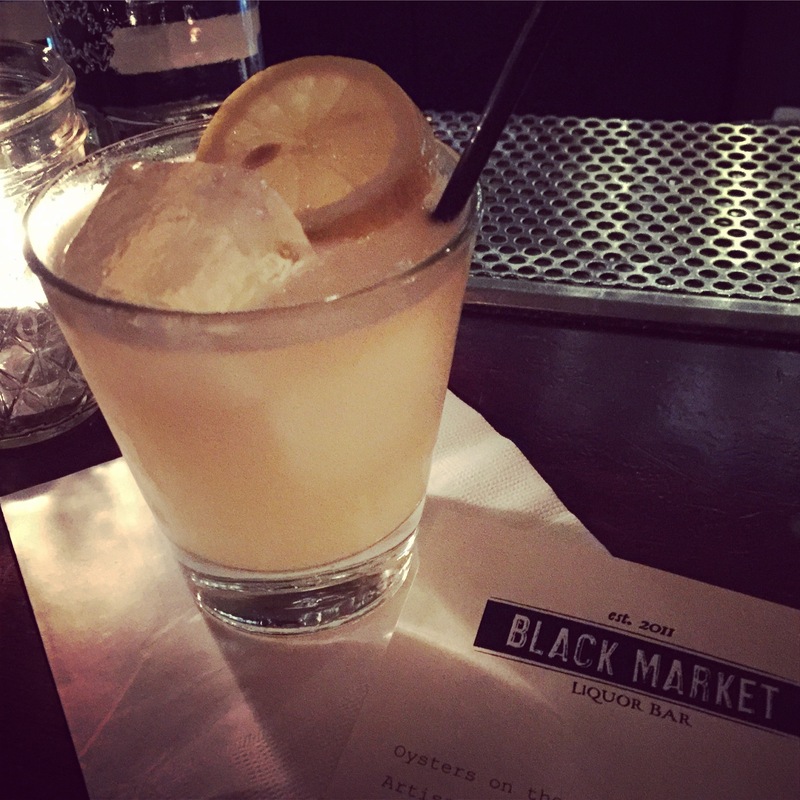 Black Market Liquor Bar, by Antonia Lofaso (familiar face to those who watch Cutthroat Kitchen on FoodNetwork) is certainly a place you should not pass up if you’re in the valley. 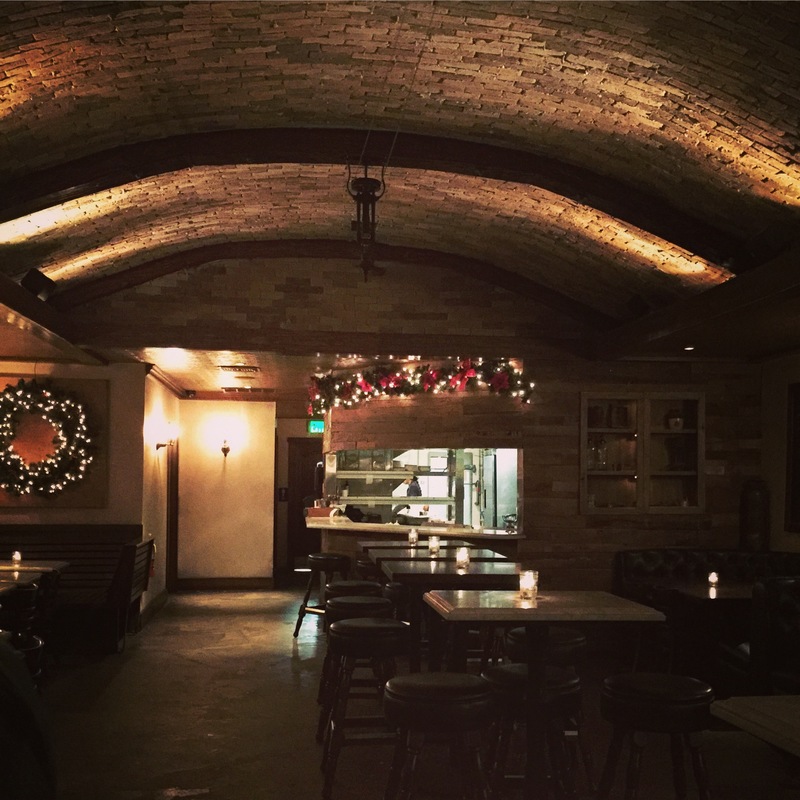 The exterior is currently under construction, but the gastro-pub is open and valet is available if you’re not interested in searching for on-street parking on Ventura and walking. Tonight we took my stepson out for his first legal drink as a 21-year old and Black Market was the clear choice for a memorable and interesting place to do it. Because we arrived shortly after it opened at 5pm, we had the place practically to ourselves. Three seats at the bar and we were in business! The menus change weekly, so what you see online may not be exactly what’s being offered on the night you visit. 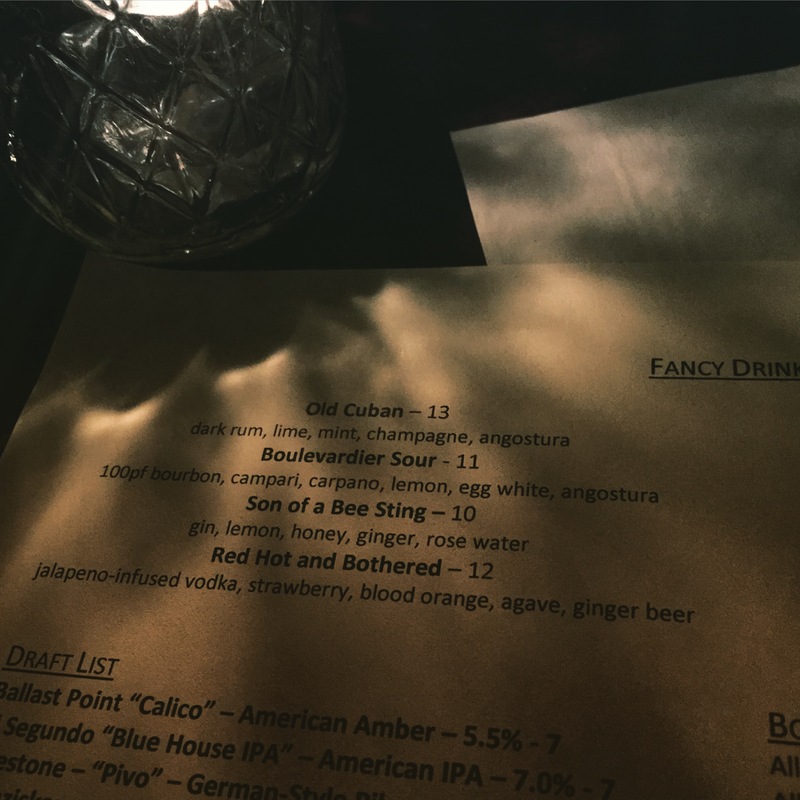 Happily, the menu tonight included the perfect drink for me: Son of a Bee Sting. I didn’t have to read past the first word (gin) to make my decision. I’m guessing that even if something isn’t on the menu, the full bar and talented bar tenders will be happy to make you whatever you ask for. The Son of a Bee Sting was made with: gin, lemon, honey, ginger and rose water. Though it sounds sweet, this drink actually wasn’t. The ginger was a background player, adding only a hint of heat, tempered by the honey (probably sugar or agave if you prefer the substitute). Any drink made from gin is a beautiful drink; thankfully none of the other ingredients over powered the gin. It was a well made drink, and encourages sipping rather than guzzling. There are no photos, but Friand enjoyed the “Old Cuban” (in honor of his father): dark rum, lime, mint, champagne, angostura. His newly minted legal drinker son had the “Boulevardier Sour” (probably the most extravagant drink he could find on the menu! ): bourbon, campari, carpano, lemon, egg white, angostura. The food menu is very promising. Again, with the dark lighting, I wasn’t inspired to read too closely once I was there, so again feeling thankful that I had read the menu before leaving our house. What I do see on the menu are several items that could be vegan if you request cheese to be left off, and others that you will have to ask “can it be vegan?” when ordering. I would highly suggest you discuss ingredients carefully with your server or bartender. My stepson ordered the cauliflower, the only words in the description are lemon aioli,so I assumed I’d steal a floret or two to sample without the dipping sauce. But no luck: the cauliflower was dusted with parmigiano cheese. All that means, though, is that it’s imperative that you ask about the items and get a full list of ingredients. There are definitely a few items that could be made vegan so long as you ask. I couldn’t pass up the Dill Potato Chips. They come with a malt vinegar aioli, which makes me sad because, being from the northeast, I grew up spraying vinegar on potato chips. Friand did take a taste of the aioli and said it was absolutely delicious. What can a person say about potato chips? Pretty much every single “homemade” potato chip I’ve ordered at other restaurants were unilaterally soggy, greasy, under salted and boring. But these were about as perfect a homemade chip as you can get! The serving may seem small when it arrives at your place, but the chips are huge, thick and delicious. But my standard of homemade potato chips is exceptionally high thanks to the father of my oldest and dearest friend in this world. And if she’s reading this post, she knows the significance of everything I ate tonight. 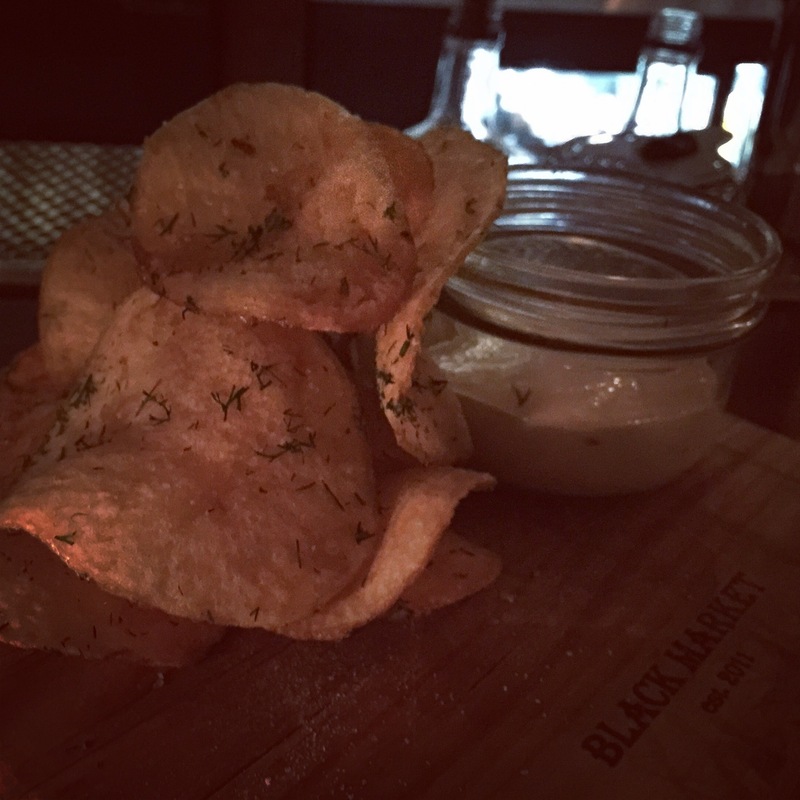 Black Market Liquor Bar definitely gets an enthusiastic thumb’s up from this vegan. There’s no real “vegan” item on the menu, but definitely a few vegetarian items that you can ask to have modified. Even if you just go for a drink and don’t end up eating, it’s well worth a visit.